440 pages | 352 Color Illus. Filmmaker Jay Holben has been battling in the production trenches for most of his life. For the past 17 years, he’s chronicled his adventures in the pages of American Cinematographer, Digital Video, Videography, and TV Technology. 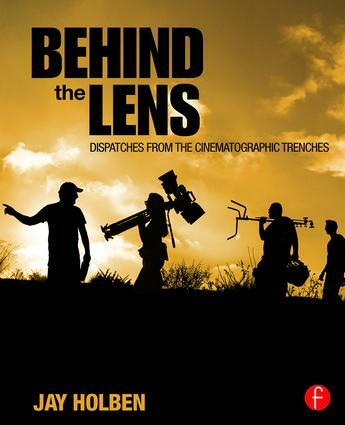 Now, in Behind the Lens: Dispatches from the Cinematic Trenches, he’s compiled nearly 100 of his best articles on everything from camera technology and lenses to tips and techniques for better lighting. Whether you’re making independent films, commercials, music videos, documentaries, television shows, event videos, or industrials, this full color collection provides the tools you need to take your work to the next level and succeed in the world of digital motion imaging. Additional tips and tricks cover improving audio, celestial photography, deciding if film school is right for you, and much more. For over a decade Jay Holben has worked as a director of photography in Los Angeles on features, commercials, television shows, and music videos. He is a former technical editor and frequent contributing writer for American Cinematographer, the current technical editor and columnist for Digital Video, and the lighting columnist for TV Technology. The author of A Shot in the Dark: A Creative DIY Guide to Digital Video Lighting on (Almost) No Budget, Holben is also on faculty for the Global Cinematography Institute. He is now an independent producer and director. For over a decade Jay Holben has worked as a director of photography in Los Angeles on features, commercials, television shows, and music videos. He is a former technical editor and frequent contributing writer for American Cinematographer, for seven years he served as technical editor and columnist for Digital Video and currently writes a lighting column for TV Technology. The author of A Shot in the Dark: A Creative DIY Guide to Digital Video Lighting on (Almost) No Budget, Holben is also on faculty for the Global Cinematography Institute. He is now an independent producer and director.